By Grande Chef Otto, NEW YORK CITY – Mom hates it when kids get crumbs on the table. Mom’s had a long hard day and when she gets home she doesn’t need the aggravation. What size crumbs we talkin’ bout? You feel a strain trying to stay cool all the time. You’re tired of always having to keep a lid on it. You’re tired of always bein’ told what to do. So, what you’ve got is basically an impossible situation, with absolutely no way out, that will almost absolutely drag on forever. OK, I feel like you’re wasting my and my readers’ time. Now I feel like you’re trying to pick a fight. I feel burned, ripped-off, used, consumed, deleted, betrayed, ejected. These…these crumb things…aren’t the real point, are they? They’re…symptoms of a larger problem. 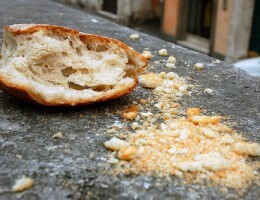 It’s…it’s not the…crumbs you hate…it’s your kids. It’s not the crumbs that’s setting you off, it’s the crumbmakers. So, then you regret adopting them? Because you thrive on the fact that it drives you completely insane. This entry was posted in Grande Chef Otto and tagged bummers, but that's exactly what i like about it, child-rearing tales, grand chef otto, iPad 2, kids, larger than Donald Trump's head, mom doesn't need the aggravation, mom hates it when kids get crumbs on the table, the brutal times, trying to stay cool at all times. Bookmark the permalink. It’s nice to see how you always make the victim out to be a victim. yeah, but u know what i hate even more? when mom gets on the table! wheres the insight? all day long and i gotta come home to this? i’m a stay at home mom, with 6 kids. if you give 6 subs to 6 kids 6 times a day (if you’re covering all the meal n snacktimes) you’re going to get a golden mean of 666 crumbs on the table per kid. it’s a bit much, right? let’s have action on this prob right away!